Are the two names supposed to string together, phonetically, the way the audio is doing it? Or is the audio just poorly parsed? 'Cause it's pretty distinctly saying "Вы Верайвановна?" to my ear. Perhaps Russian normally does this when one word ends in a vowel and the following word begins in a vowel which are compatible with one another for gliding into each other? I know there are languages out there which do this. 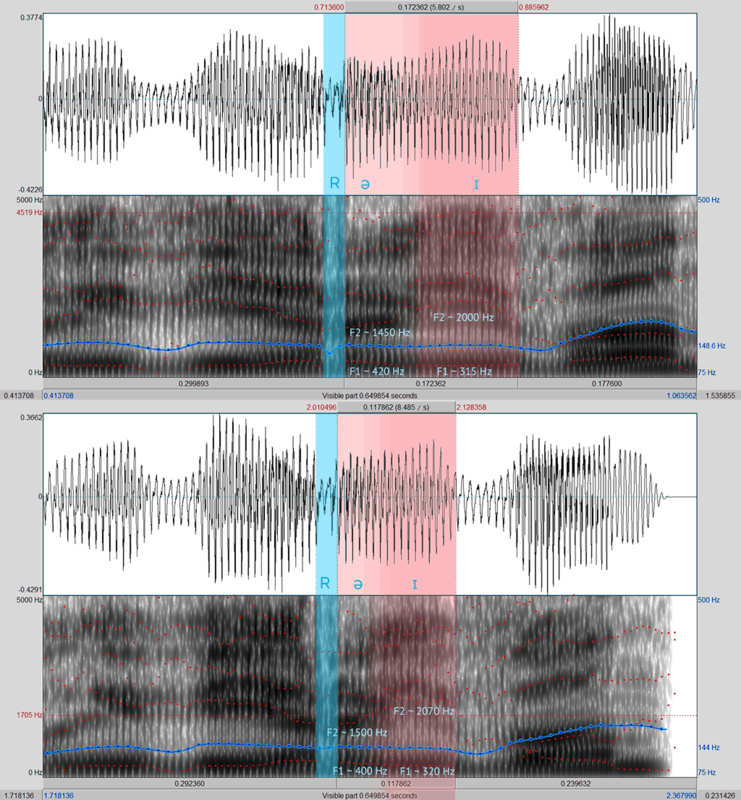 Here is what happens acoustically when you compare post-tonic «а» + pre-tonic «и» to a single post-tonic diphthong «ай». Note the somewhat extended transition (which, admittedly, may appear with two vowels, too) and how the unstressed diphthong is half again as short as the two unstressed vowels (I read a few takes of both sentences, at approximately the same speed). At the very least, it is easy to see that а+и together are longer than the previous syllable (which is stressed), while the unstressed ай is about the same length at best. Here is the audio containing the two fragments, in case you want to give it a try: https://drive.google.com/file/d/0Bwnv5yanxuG3QnhGRDl1R0o1WjQ/view?usp=sharing . Of course, a native speaker would barely notice anything if you read it "Верайвановна" because the temptation for the interpretation to make sense is too strong. The sounds are not clear and long enough to guarantee that the listener registers that the speaker is, in fact, is saying gibberish. I cannot say the TTS performs much different from what I can see in the recordings of a real female. You are right, there is no syllable separation. The syllables simply follow one immediately after another. However, judging by its length, аи is two vowels (I don't think that at a natural speed the length of the transition is a reliable cue, and the formants are virtually identical). «Вер» and «ван» are clearly stressed, whereas the sound combination in question has a lower pitch, somewhat less energy and a /ə/. Thus, the sound cannot be a stressed diphthong. But, being longer than a similar stressed vowel, it cannot be an unstressed one either, so it is interpreted as two vowels by native speakers. Objectively, of course, the vowels do flow one into the other, especially when not read slowly. People are not robots, so some mininal time is needed to change the shape of the vocal tract. Here, you have about 0.4-0.5 seconds to pronounce 4 syllables (/vʲe̞rəɪvä/ — a ə might actually be an ɐ, depending on how you describe it). The resulting sounds might sound like diphthongs of some other language. Or not. In the first two iterations, I don't hear a diphthong, but in the last two, I do. Or to rephrase, in the first two iterations, I hear it differently than the audio here on Duolingo, insofar as that the vowels are clearly separated into two syllables (albeit, still rather subtle), whereas in the last two iterations, I hear it like I do here on Duolingo, insofar as that I don't hear any syllable separation between the vowels in question. You are a beautiful angel, my friend. Your ear is not yet trained. Objectively, the И at the beginning of Ивановска is clearly longer here than А at the end of Вера and less tense than a stressed И or a Й would be, so "ай" is unlikely. They would not be that different, though, so your main primary way to know what you hear shoukd be the lack of йв-starting words in Russian. Thanks. I'll keep trying. And you're definitely right; my ear is not yet trained. Though I'd point out that I wasn't trying to suggest that there are any йв-starting words in Russian, including this one. As far as I know, if a Russian word starts with й, then it must be followed by a vowel. That's why I put the two names together as one word in my transcription. It sounded to me like it was being strung together as one word (in its pronunciation). If I were to use an English notation, I might've transcribed it Vyerive-ahnovna (I haven't been using the Latin notation version of this course; only the cyrillic. So I'm sure this notation probably doesn't reflect the way Russian is written in the Latin alphabet, but it's not trying to, anyway. I'm just trying to illustrate what I'm hearing is all.). Ah, of course. There is no pause between these words. But that's what you do in English as well, don't you? In response to the link you provided, there would be no glottal stop in "now eat", that's true. But there's still no diphthong being created between the two words. Although it would be impossible for that to happen anyway, since "now" ends in a diphthong to begin with, and a diphthong can't diphthongize into another diphthong. lol. Also, "now" doesn't end in an [ə] or an [ɑ], and not everyone of every dialect would insert that glottal stop of which I mentioned. Although you seem to be contradicting yourself here, when you say "each vowel has its own syllable... the glide is rather short." If there is any glide at all (regardless of how short), then that means that there's a diphthong, because a diphthong is a glide, and if there's a glide, then that means it's only one syllable, not two. You can't have two vowels be two syllables and a glide, that's just not how it works. lol. Ah, sorry. I mean not a glide of course but a transition between the two vowels. What language do you speak? I see you are 13 level in English. That's not what I hear here (which you can also check by looking at the waveform to see that there is no pause whatsoever between "now" and "eat"). No diphthong is created in Вера Ивановна: first, each vowel has its own syllable, and second, the glide is rather short. It pretty much takes the time required to comfortably reshape your vocal tract from /ə/ to /ɪ/. YOU DIDN'T WRITE 'Bepa' IN RUSSIAN CHARACTERS DID YOU? What do you think guys about extending a bit the translation of Вы to indicate that this is the formal way to address someone? Thanks. EDIT: Replaced the wrong "бы" for "вы" in the question. So the verb of an action with the particle means that thats something a person would do (in the future or in past) but didn't or won't necessary do. It makes the situation imaginery. Oops. Thanks for your answer. It made me realize I made a mistake. I use to type "Б" when it should be "В". This, because on my keyboard (US) when using the the russian mapping, the roman "B" corresponds to the slavic "Б". Ah! I just left a comment asking about the difference, guessing at formality. That sort of thing would be helpful, if perhaps tricky to integrate well in general. It's driving me crazy, but does it sound like she's saying "Ah-vee" in her pronounciation of "Вы"? As a native English speaker, I know I have YEARS to go in even understanding the nuances of this language, but I'm so confused right now. Missing something here - what's the difference between ты and вы? Both seem to mean "are you", with no gender distinction or anything else I've noticed. Is it a honorific distinction like tu/vous and du/sie? Exactly, also like "tu/usted" in Spanish. In this case "Вы" is the formal way to address someone, and "Ты" the informal one. Whats the difference between ты and вы? are these name really common? Why вы instead of ты? Oh nvm, I got the answer from @Beltrix. Btw, are comments deletable? I see that full russian names have there name repeated again with something at the end of it, what us this for? -ovich is '-son'. So Ivan Ivanovich = John Johnson. Again with the spelling perfectly. What's the name of your father? How To: Find Vera Ivanova in Russia. What i heard is "Vy vyeravwvywywvffwwnna?" It is a patronymic, i.e. you can tell that each of the persons had some Ivan as a father. A given name + a patronymic is a common form of polite address in Russian. Would it help people to explain that it's genitive case? It's similar to the Viking "Erikson" names or the old English style of "Robin of Nottingham"
Thank you Igor! I have been wondering what is up with these names in this lesson. I did not understand patronymic until now. Thanks again!